Spread across 30,000 sq ft, the studio offers more than 22 live kitchens. 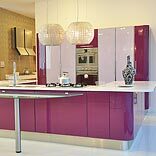 Cucine Lube India, an Italian Modular Kitchen company has opened Asia’s largest modular kitchen studio in New Delhi. Spread across 30,000 sq ft, the studio offers access to more than 22 live kitchens. This world class studio houses a complete array of Lube’s creations with more than 1000 options in terms of design. The showroom has an Orientation Centre where customers are provided with Live Demonstration of the products in all aspects be it the finishes, materials, hardware, colours, internals. By using the Italian designing software, the qualified staff can help customers get three dimensional realistic views of their kitchens. Keeping in mind the Indian style of cooking, Cucine Lube recently launched the water proof kitchen cabinet that is a revolution of sorts vis-à-vis other players in the market who offer only water resistant kitchen cabinets. With the launch, Cucine Lube is offering a flat discount of 32.75 per cent on all kitchens with a huge set of free gifts in the form of counter tops and appliances. This offer is valid from 6th January – 15th February 2013 in their new showroom and all their studios across India.